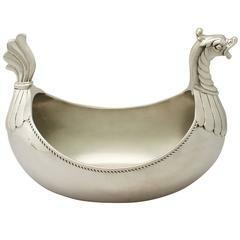 This Large Sterling Silver Centerpiece Bowl with Glass, Germany, circa 1900 is no longer available. 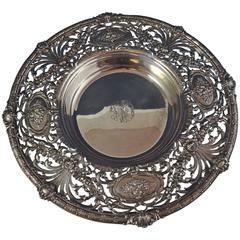 Large centerpiece with glass insert of silver, probably Germany, circa 1900, silver driven with continuous Rocailldekor at the upper and in the lower area, inside gilded and oval base, two handles in the form of lion heads with oval handles in Kreuzbanddekor , original, honed and facetted glass, twice marked Austrian import hallmark (1902-1922 for foreign silver, at least 750%) , 1460g. Mid-Century Modern Classic glass fruit bowl centrepiece, Italy. 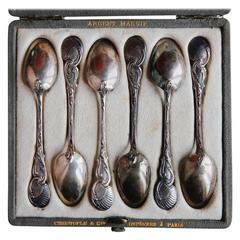 A set of six truly exceptional for the richness of the decoration sterling silver dessert spoons. The set is within its original box. France, circa 1890. 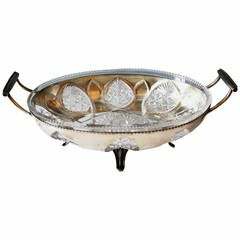 Art Nouveau silver centerpiece circa 1900, glass is in perfect condition. Fully hallmarked silver 800/1000. Weight of silver 184grams.